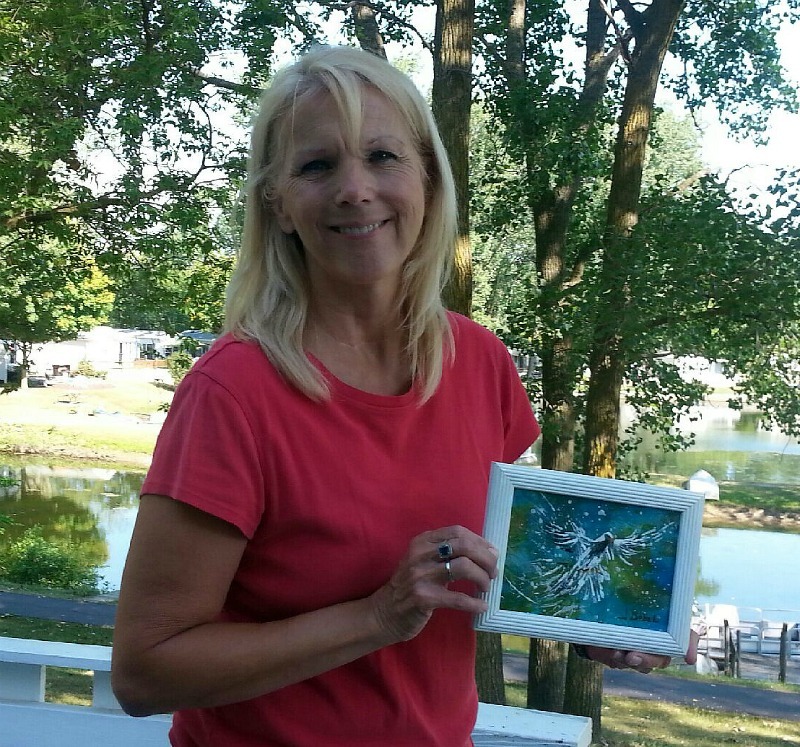 Much of Laura’s art is painted for commission or is purchased by avid art collectors. 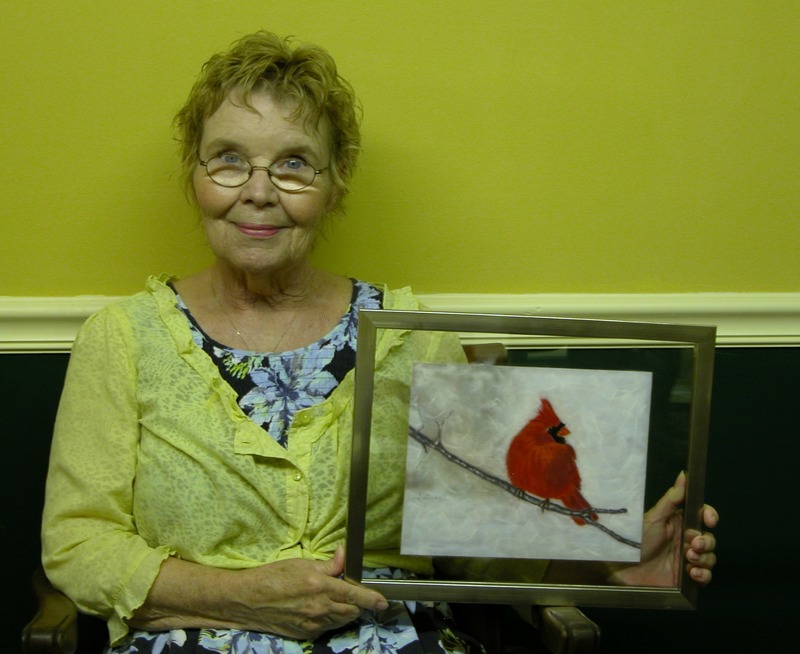 We are always delighted to see others enjoying her work. If you are a decorator or a collector, or even a fan and have something specific (whether subject matter or color scheme) you’d like painted, please contact Laura and she’d love to make your dream a reality. If you are captivated by one of these works, you can still purchase them as prints. © Laura Gabel, “Day Three”. 24 x 30, acrylic. Private Collection. © Laura Gabel, “Sarasota Waterfall”. 24×48, acrylic. Private collection. © Laura Gabel, “Grace Sunrise”. 24” x 36”, oil. Private collection. © Laura Gabel, “Lincoln”. 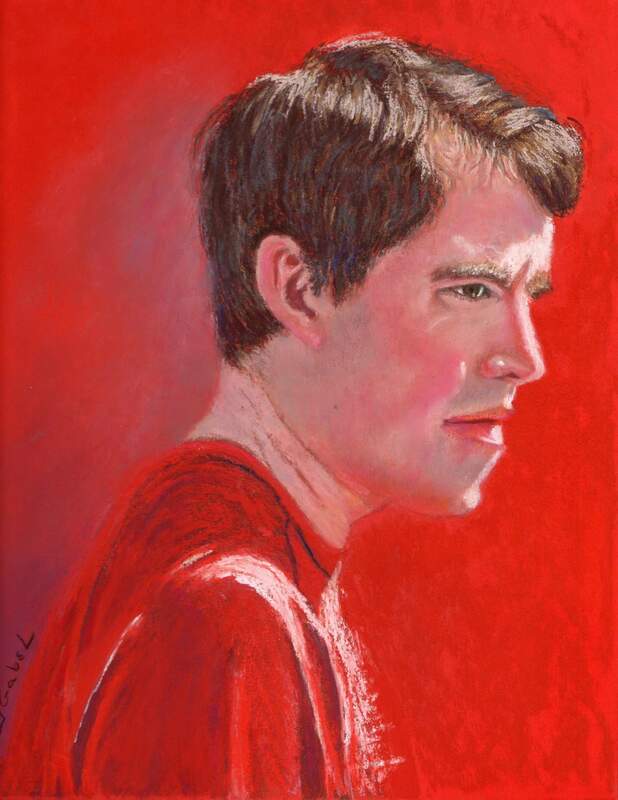 Soft Pastel on Uart, 16.5×13. Private collection. © Laura Gabel, “Ian and Sally (Boo)”. 17 1/2 x 10 3/4, soft pastel. Private Collection. “Thank you so much for this, Laura. Sally (Boo) was a very special little person and I was lucky to be able to share some of my life with her. This picture undoubtedly captures the special bond that we shared from the first time her eyes met mine that day I saw her in the dog rescue home ten years ago. I couldn’t wish for a better tribute to a much missed friend.” Ian, England. © Laura Gabel, “Austin’s Wolf”. Soft pastel, 18 x 24. Private collection. There is both a fierce wildness and a lingering softness in the eyes of this wolf. He is powerful, strong and untamed. At the same time, you can see a glimpse of your favorite, lovable canine pet. Wolves and dogs are not so far apart, as this painting reminds us. Bring a bit of the wild side into your home and enjoy this magnificent creature. Love the original? Purchase the print! “I love my “Roosters”! The first one, I just admired how he looked and the colors I thought he would be great in my kitchen. He reminded me of the roosters that wandered into my yard in Colorado. He had the same coloring and it took me back to a great memory of my home and courtyard in Strasburg. 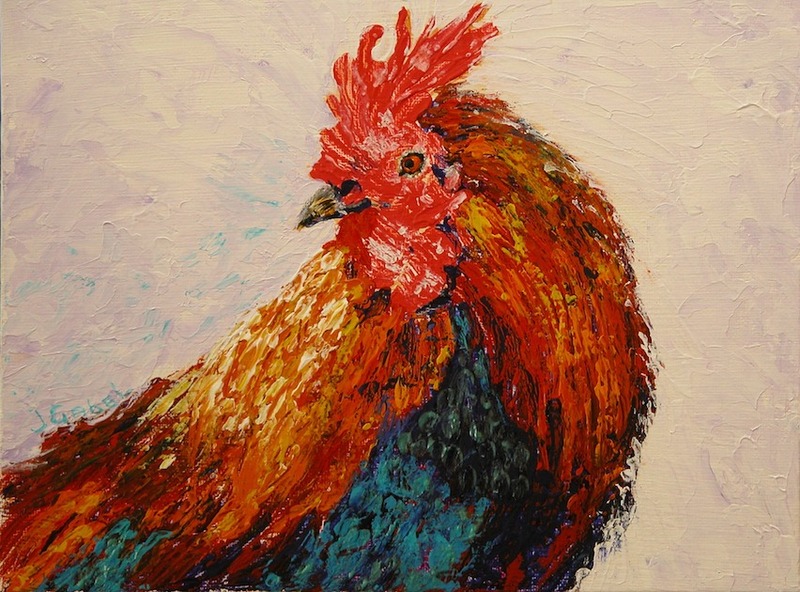 Utilizing a knife instead of a brush lends a deep, rich texture to this fowl friend. 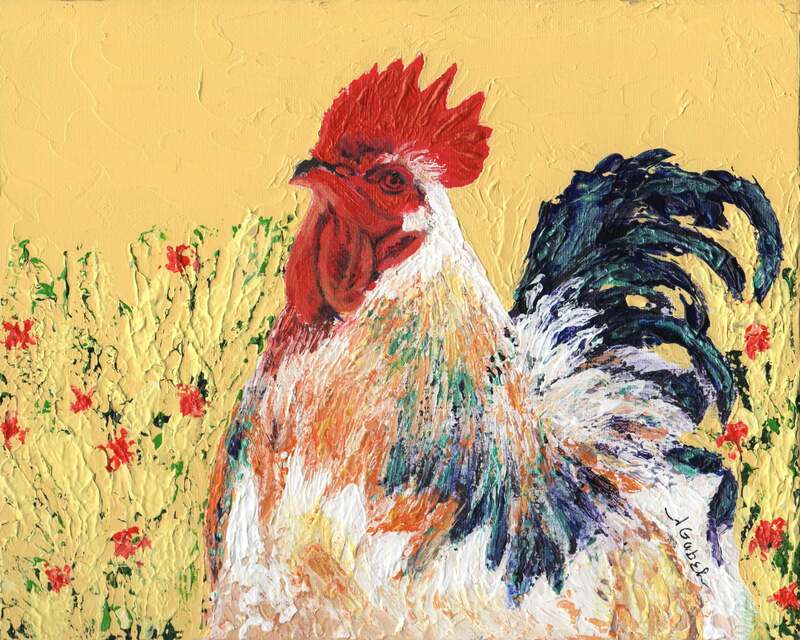 Each knife stroke emphasizes the luxuriously rich plumage of this charming rooster. His brilliantly colored feathers stand in sharp contrast to the pale background, causing him to shine all the more glorious. Bring some farmhouse whimsy to your house today. In her second foray into using a pallet knife, Laura has brought to life yet another feisty rooster. The brilliance of his cockscomb is matched only by the cockiness of his eye. What mischief is he about as he roams through the poppy field? Bring home a little of his attitude along with his portrait and enjoy the escapades that follow. © Laura Gabel, “You Are His Masterpiece”. Acrylic on canvas, 8 x 10. Private collection. “One of my most prized possessions! 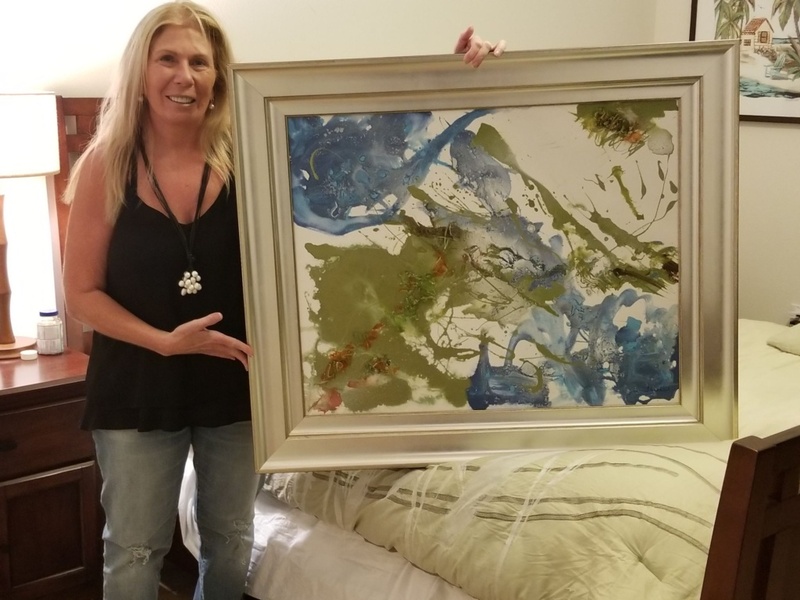 A gift from a beautiful talented lady that has already blessed my life so much with her gift of hospitality and encouragement.” Kathy T.
“For you are God’s workmanship…..” His masterpiece. You were created for a purpose. Just as the Scriptures use the dove to represent the Holy Spirit, let this print remind you of His creative presence in your life. Let His creative purpose flow through you today. © Laura Gabel, “Winter Watch”. Pastel on UArt, 10 x 12. Private collection. “We look with our eyes, not with our hands.” But don’t you feel like you could almost touch this watchful cardinal? He’s on the lookout – for his mate? his dinner? the coming storm? He is a beautiful sentinel in the midst of the harshness of winter. You can see his feathers puffed up to protect him against the bitter wind and cold. His crimson plumage is a starkly fresh reminder that even when all around seems bleak, beauty can be found. Bring him home as a constant reminder of that beauty in the midst of whatever storms come your way. © Laura Gabel, “More Than A Mouthful”. Pastel on UArt, 10x 12. Private collection. A jalapeno pepper that looks good enough to eat without any of the spicy aftermath! Peppers are essential to so many types of cuisine and a good chef knows how to use them to add not just heat but flavor as well. 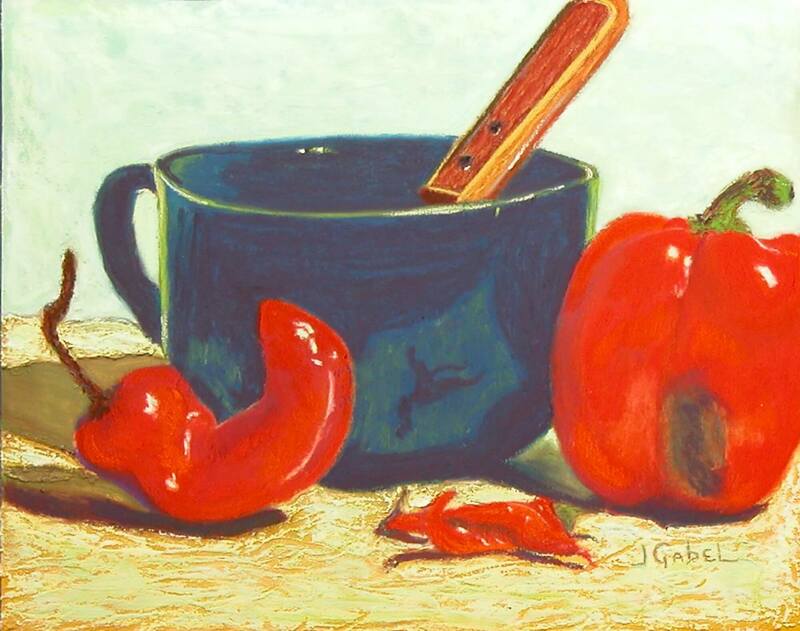 Take home this print to liven up your kitchen and inspire you to create your own culinary masterpieces. © Laura Gabel. “The Slugger” , Pastel and Watercolor, 11 x 14. Private Collection. 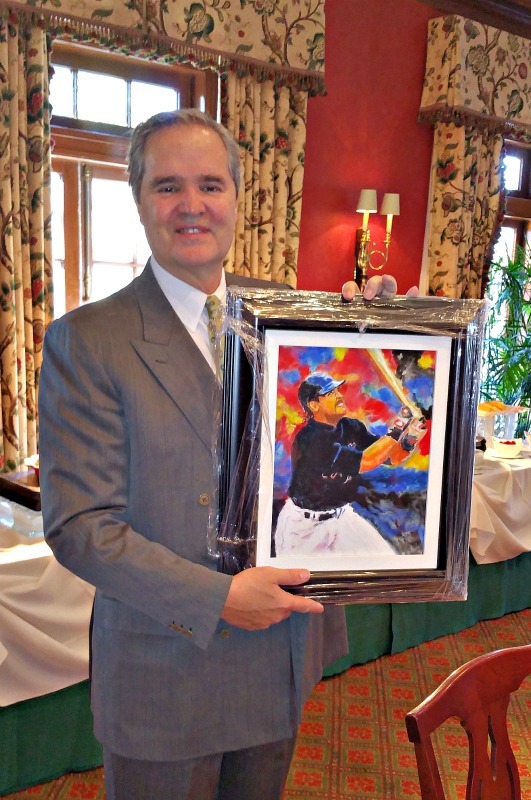 A birthday gift for Tim D.
2016 was an historical year for baseball as the Chicago Cubs broke the longest championship losing record in all of professional sports by winning the World Series after an 108 year drought. 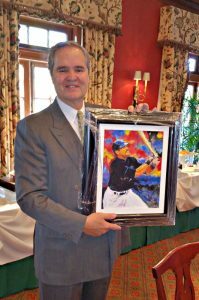 You may not be a Cubs fan, but any baseball fan will appreciate this fantastic rendition of a baseball player in motion. Originally commissioned to commemorate Mike Piazza’s induction into the Baseball Hall of Fame, this print would be a wonderful addition to the memorabilia any fan of the game. © Laura Gabel, “Joyful Morning”. 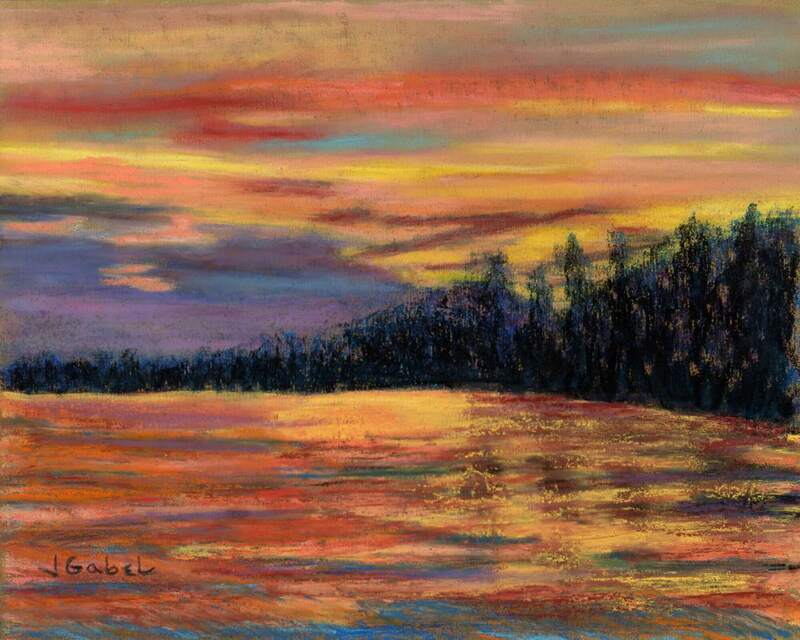 Pastel on UArt, 19 x 16. Private collection. We have all experienced dark nights of the soul when it seemed as if God had turned His face against us. This beautiful landscape reminds us that His light will break through in the morning and bring us great joy. As the sunlight peeks from the upper window of the mission and illuminates that countryside, may His love bathe your world with color and joy. “ Weeping may tarry for the night, but joy comes with the morning.” (Ps. 30:5). © Laura Gabel, “Billy & Grandson”. Acrylic and canvas, 16.5 x 13.5. Private collection. Capture the perfect moment of a grandfather and his grandson. As they sit looking out over the water, watching the fountain, memories of the day running through their minds. 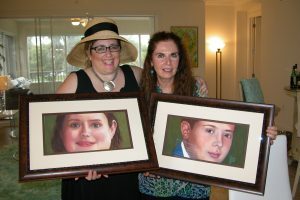 Children don’t stay little forever and photographs can fade, but a painting of special moment is eternal. 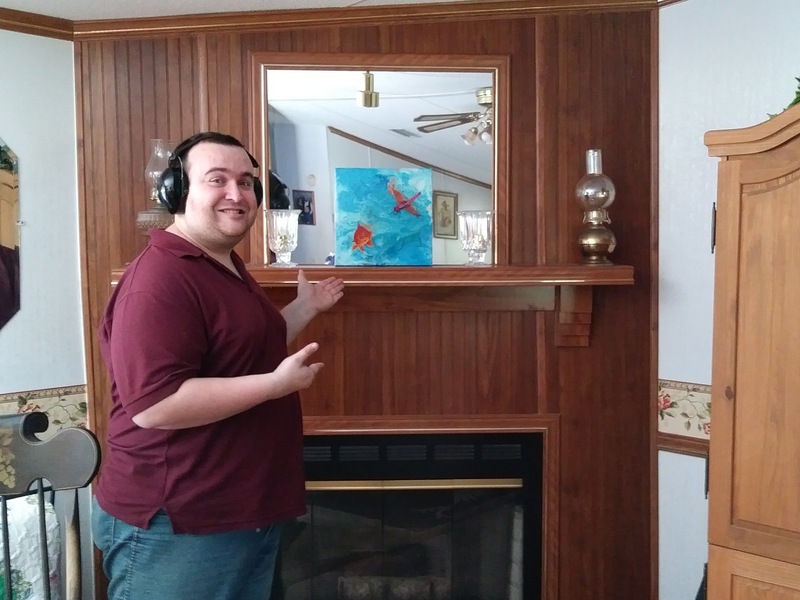 Enjoy this touching scene or contact Laura to paint one of your own. © Laura Gabel, “Alan’s Peaceful Place”. Soft pastel, 36 x 48. Private collection. 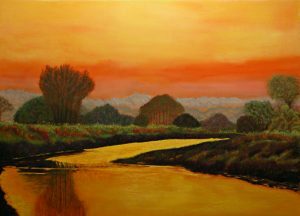 private commission for Alan K.
In a magnificent expansion on the theme and image of “Glorious Foretaste”, Laura recaptures the serene beauty of a landscape awash in the faint sunlight. Is it the beginning of the day, the dawn of new hope? Or is it the peaceful, quiet calm that comes with the ending of the day? Either way, come and lose yourself in the beauty of creation and find rest for your soul. © Laura Gabel, “CharBoy”. Charcoal, 8 x 10. Private collection. 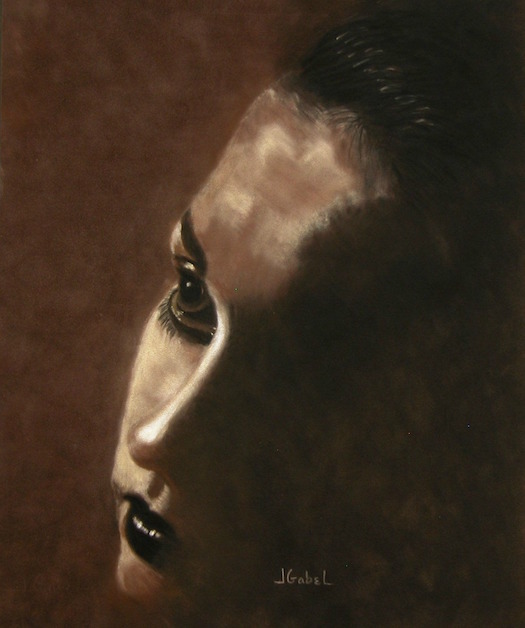 In a departure from her vibrant pastels, this dark, shadowy charcoal portrait highlights the artist’s intimate focus on the human face. If a picture is worth a thousand words, what volumes are contained in the expression of this boy? His eyes, his mouth, the lines on his face all suggest an intensity of feeling – is it sadness? curiosity? wonder? fear? In our fast paced, twitter feed culture, we don’t often take the time to really look one another in the eye when we communicate. Take this boy home with you and remember the value in face to face knowing of one person to another. © Laura Gabel, “Glorious Foretaste”. 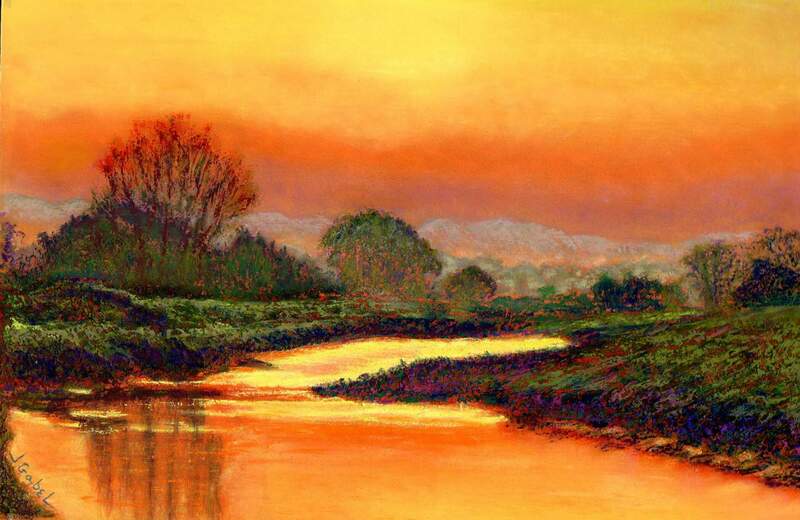 Pastel on UArt. Private collection. 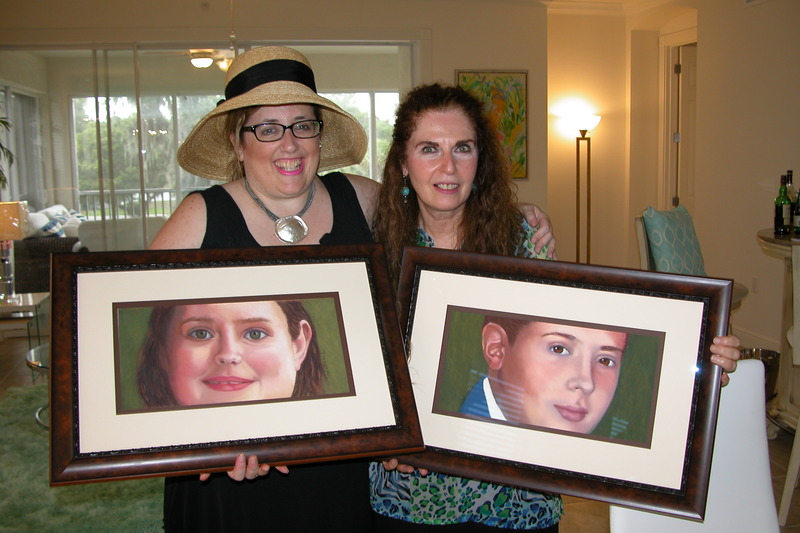 “I have seen many of Laura’s pieces “in progress” and own several original art works. Laura’s “River Landscape at Sunset” [that’s what I call it] is one of them. It makes me feel good and hopeful about life, and God’s continuing love for us all. 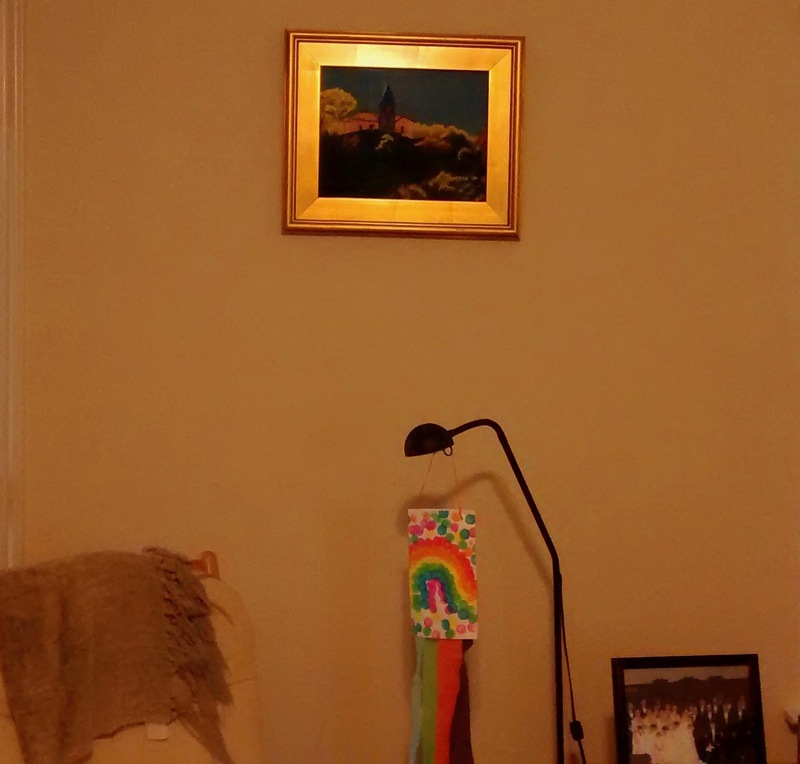 The picture hangs in my dining area where I see it many times every day.” Tom G.
Where is your “happy place”? What makes a place “happy” – is it free from pain, broken relationships, sickness? Sometimes our lives here seem far from happy. In Heaven, life works the way it was meant to work, and we see things as they really are. 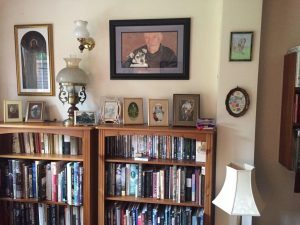 When community and relationships work here, despite the messiness and mistakes, we get a glorious foretaste of what it will be like in Heaven. There is real beauty, real goodness, real truth. Remind yourself of those future realities by hanging this inspirational print in your home today. © Laura Gabel, “Heaven’s Cattails #1”. Acrylic on canvas, 18 x 24. Private collection. 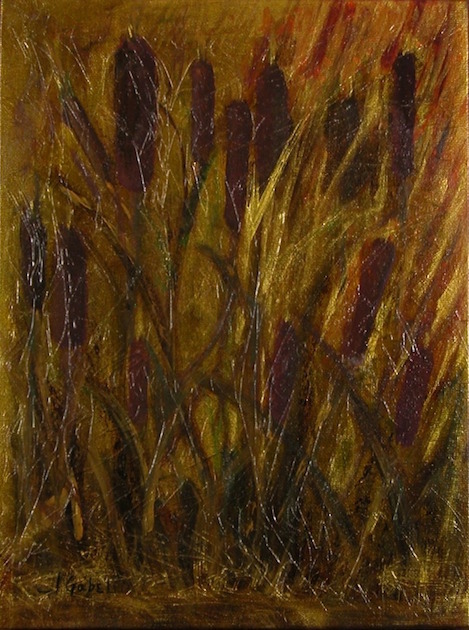 Decorator’s commission for Alan K.
While similar in subject to “Cattails #1”, a completely different color palette results in a completely different painting. 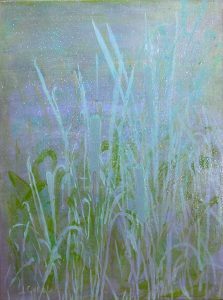 The ethereal quality of the blues and greens in this painting lend an otherworldly quality to these common marsh plants. A stunning accompaniment to a coastal decorating scheme, this print would also be a striking accent piece in a more neutral environment. © Laura Gabel, “Horse in Heaven”. Acrylic and watercolor, 9 x 12. Private collection. 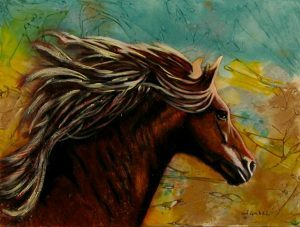 Combining the two different media of acrylic and watercolor, Laura has managed to capture the beauty, majesty, and strength of this creature. The horses’s muscles and sinews are taut with action while an ethereal blaze of colors surround him. You can almost feel the wind as it blows through his mane as he gallops along. Won’t you join him? © Laura Gabel, “Intensely Will”. Pastel on Uart, 12 x 14. Private collection. © Laura Gabel, “Into the Light”. Soft Pastel on Velour 15.5 x 18.5. Private collection. Decorator’s commission for Leesa D.
Any fan of jazz is certainly familiar with Billie Holiday. What better way to commemorate her legendary mastery than with this hauntingly beautiful painting? The way she looks into the light, almost as she is awaiting something – inspiration, salvation, rescue, encouragement? The expression on her face captures all the pain and sorrow mixed with beauty that led to so many amazing songs over the years. 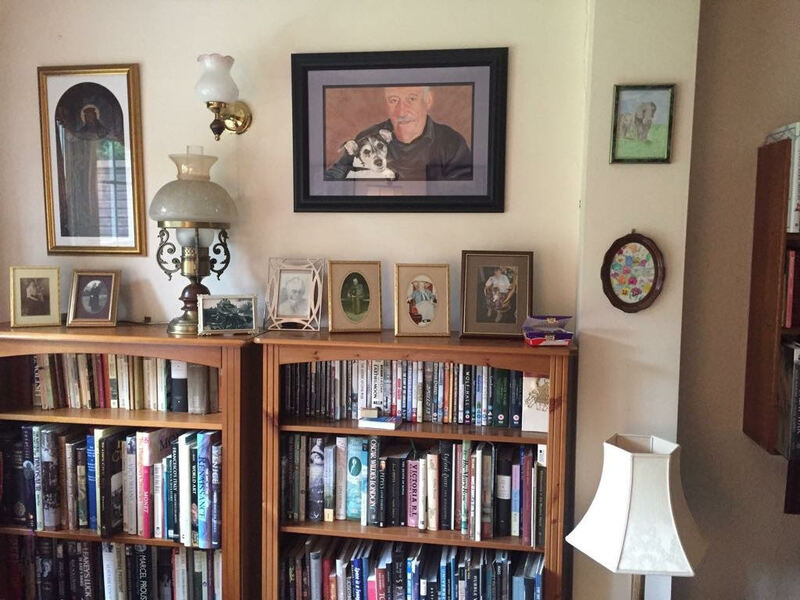 Billie may be gone, but her influence lives on; bring her memory home as well. © Laura Gabel, “Just Dandi”. Pastel on Uart, 9.5 x 11.25. Private collection. A weed is just a flower that grows where you don’t want it to grow. But a “weed” placed artfully in an ewer is a thing of beauty. 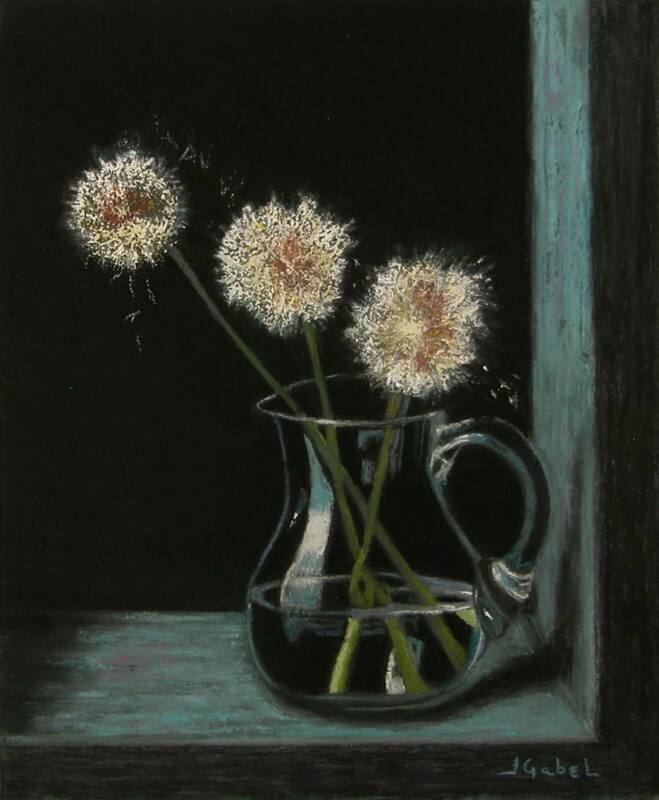 This striking still life creatively showcases the delicate softness of the humble dandelion as it is going to seed. The careful pastel strokes bring the glass and the water to life even as the flower dies. This print would make a charming addition to any wall. 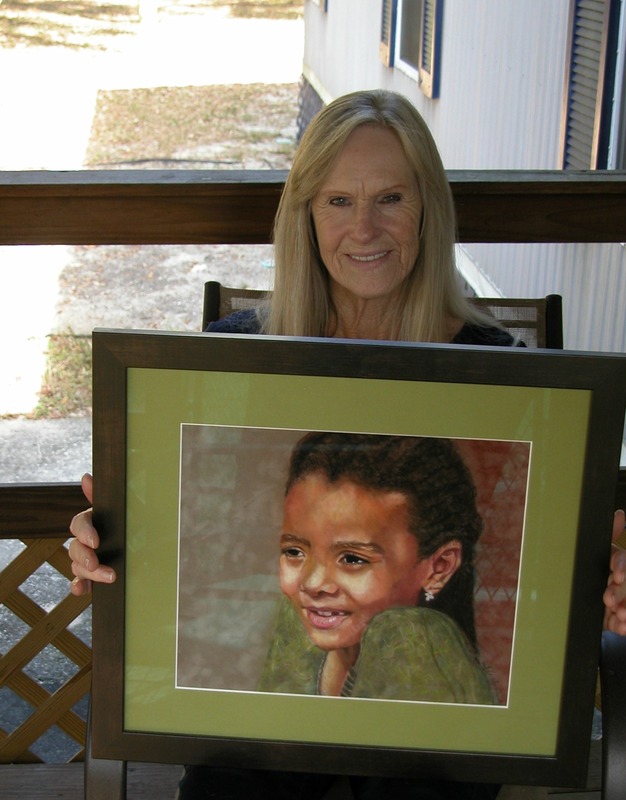 © Laura Gabel, “Little Evie”, Pastel on UArt, 17 x 15. Private Collection. The world always looks a bit different through the eyes of a child. Come and experience the wonder and delight through the inquisitive gaze of little Evie. The light and lines of her face capture so beautifully the innocence and magic of childhood. Do you remember what it was like when everything was new and exciting? 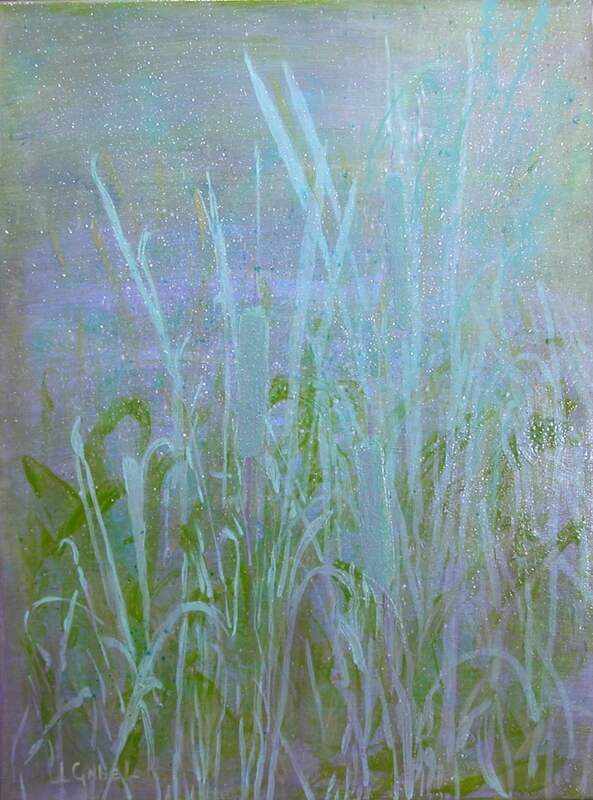 Rediscover your sense of wonder with this magical pastel. © Laura Gabel, “Mauve Leaves”. Acrylic on canvas, 24 x 48. Private collection. Making a switch from her usual symphonies of color, the muted tones of this artistic “treescape” cause the viewer to pause and ponder. The vastness of the painting, the soft brush strokes, the delicate leaves, all combine to bring a “hush” to the cacophony that so often fills our days. An exquisite statement piece to enliven the decor of any busy home. 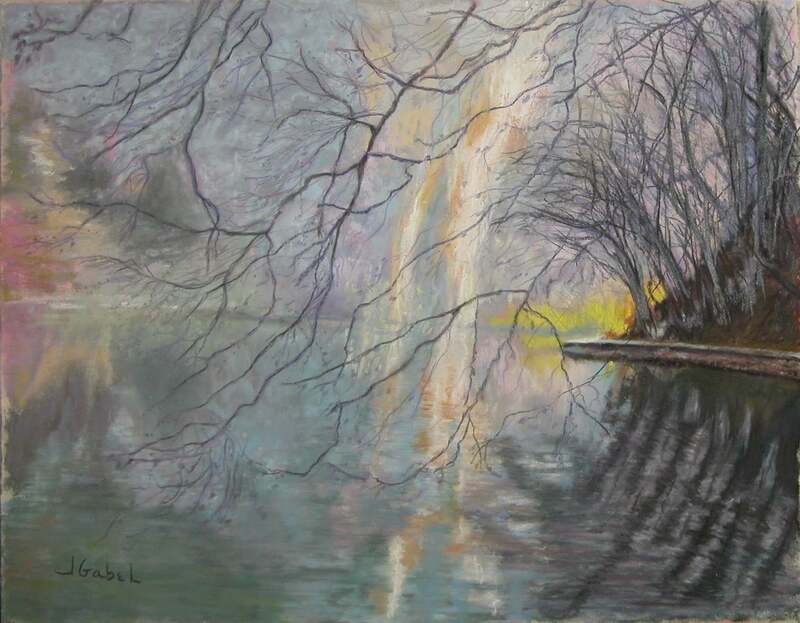 © Laura Gabel, “Morning Glory.” Pastel on UArt, 11 x 14. Private collection. The barren, stark nakedness of the trees contrasts with the brilliant glory of the morning streaming through from the background in this unique landscape. 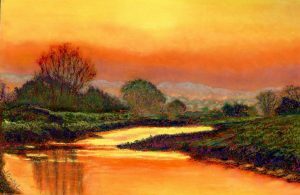 The soft pastel colors and strokes lend a quietness to the entire scene. In the moments when circumstances seem bleak, we can remember that weeping may tarry for the night, but joy comes with the morning (Ps 30:5). © Laura Gabel, “Pear Gem 1”. 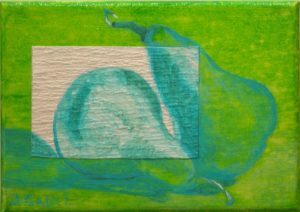 Acrylic and canvas, 5 x 7 Private collection. 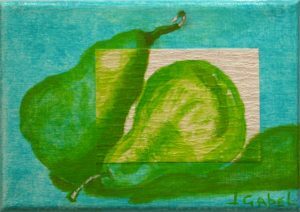 © Laura Gabel, “Pear Gem 2”. Acrylic and canvas, 5 x 7 Private collection. Fresh hues of blues and greens capture both the negative and positive images of these pears. A stunning addition to your decorating scheme, these fruit prints capture the luscious, juicy pears just waiting to be eaten. You can smell their sweetness and imagine the firm, crisp flesh as you take a bite. Bon Appetit! Love the originals? Purchase both prints! Hot peppers, sweet peppers, and everything in between. The ordinary items on your kitchen counter are transformed in this vibrant still life. 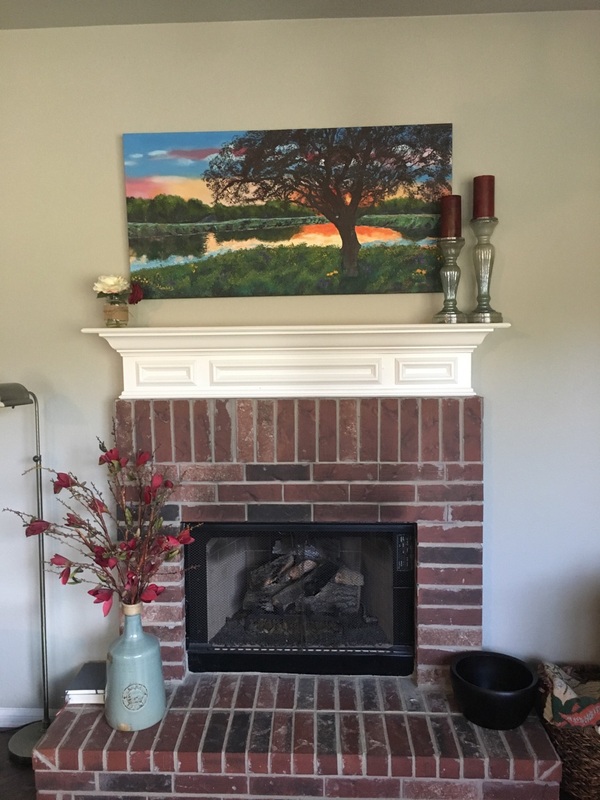 Art is all around us and Laura has captured that moment in time perfectly. 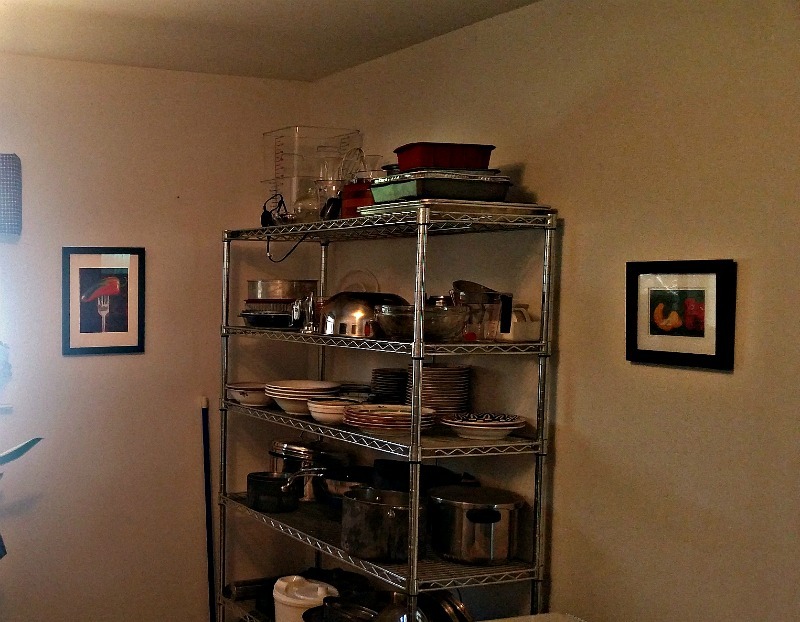 The perfect inspiration as you are cooking up your next meal. © Laura Gabel, “Rainbow Evening”. Pastel on UArt, 10 x 12. Private collection. The softness of the sky just before dusk descends is beautifully captured in this pastel rendering. The symphony of colors from the setting sun reflected in the water below is indeed as breathtaking as a rainbow after the storm. Come and lose yourself in the quiet loveliness of this scene. © Laura Gabel, “Red Panda 2”. Pastel on UArt, 16 x 13. Private Collection. Who is this inquisitive little guy? The Red Panda (sometimes referred to as the “lesser panda”) is a shy and solitary creature. 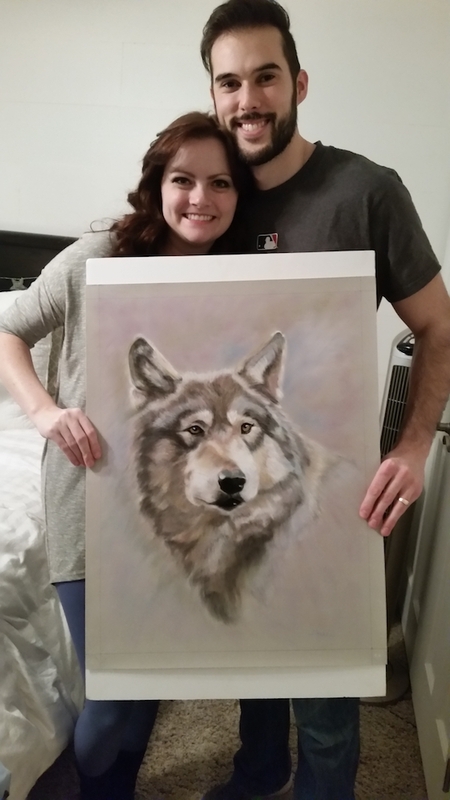 Here in delicate pastel strokes, Laura has captured the fierce beauty of this endangered creature. There is nothing “lesser” about the delightful expression on his face. An exquisite tribute to a seldom seen wild animal, captured through art in his natural bamboo habitat. © Laura Gabel, “Sunset Silo”. Pastel on UArt. Private collection. Barns, farms and silos seem like a long ago forgotten piece of Americana. 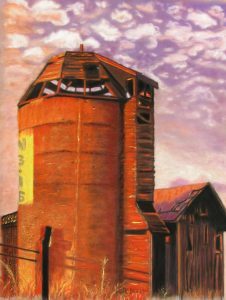 But there is something hauntingly beautiful about this abandoned barn and silo. Just as the sun is setting in the painting, so the sun has set, perhaps long ago, on the family that lived and worked here. What was their story? How long had they lived off the land? How much grain had been stored in this silo that then used to feed and nourish their family and livestock? All art should tell a story, and the story of this painting is yours to tell and yours to share; so take it home and let their story be told. © Laura Gabel, “Winter with My Lover”. 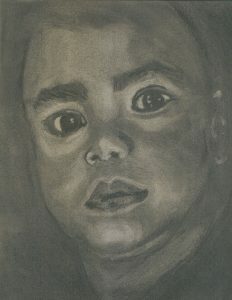 Charcoal, 10 x 12. Private collection. “Who is that coming up from the wilderness, leaning on her beloved?” (Song of Songs 8:5). The dark and somber hues of this charcoal piece lend an ominous and heavy tone to the work. But the brightness of the two figures in the middle reminds us that not all is at it seems. In the darkness, in the winter, in the sadness, we are not alone. There is another who walks with us, who loves us and who will never leave us. Let this scene be a reminder to you in those times of great difficulty of the One who calls you His own and walks with you. © Laura Gabel, “Lovelock’s Lavender”. 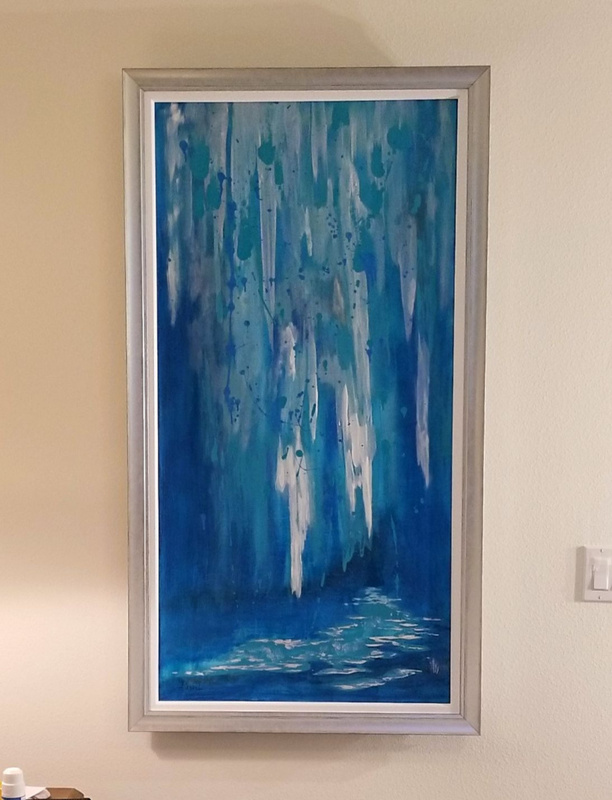 Pastel on UArt, framed with a black mat and frame, 15 1/4 x 15 1/4. Private collection. If you close your eyes, you can almost imagine the magnificent fragrance of this field of lavender. It’s beautiful floral notes instantly soothe your spirit and calm your soul. 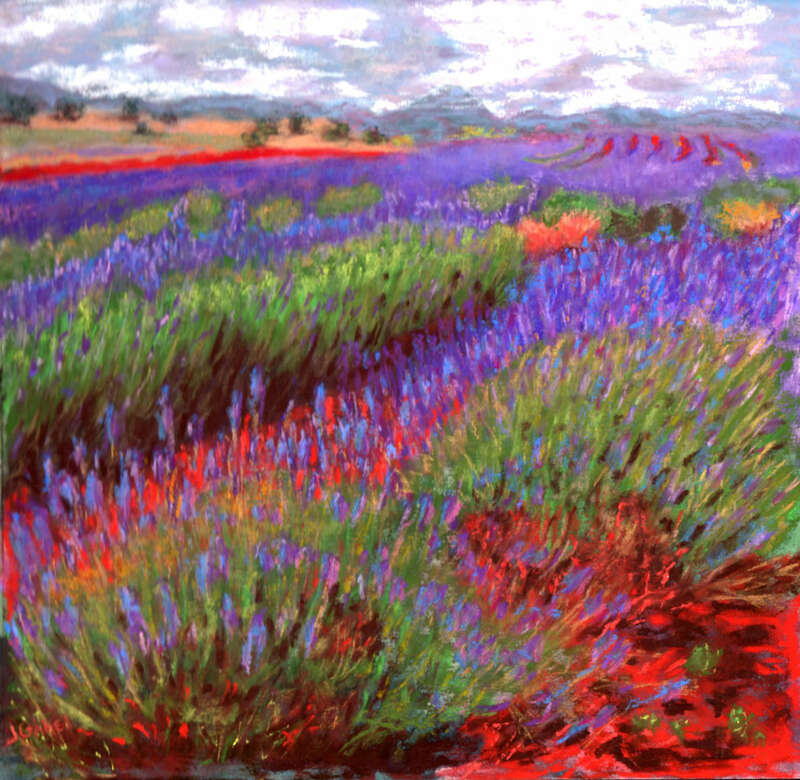 Lavender has been around for centuries and is cultivated all over the world. It’s flowers are used for perfume, oils, and even cooking. 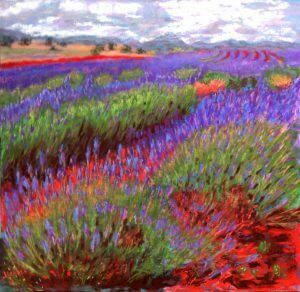 The scent of lavender has been used for soothing crying babies, laboring mothers and stressed out workers. While we can’t bring you the scent, you can bring home this visually stunning print to enjoy and soothe you in your own home. 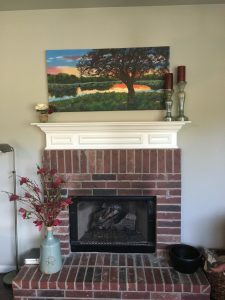 If you are interested in commissioning Laura to create a specific work of art for you (either for your own collection or as a gift), or if you are a decorator looking for a unique piece of art for a client, please contact Laura with your requests.